I am in the process of adding additional content to PH both on this WordPress home page and the forums. You will see some temporary "features" like the missing photos from this home page and other features that will come and go as I learn WP and enable content. Also, if there is a subject/topic that you would like to see discussed on here let me know. If you are an experienced amateur radio operator and would like to write an article for the site, PM me and let me know. In order to help pay for the site and generate some revenue, you will be seeing some "ads" on this page and in the forums. I will have a Amazon affiliate account and when reviewing something like the new Baofeng BF-F8HP(of the F9 version) that I bought, I will report my findings here. If that product is something you might like to look at, there will be a click-able link in the review that will take you to that product page on Amazon. This little radio was a big hit as I out preformed the old stand by Yaesu FT-60 that most of the guys were using. I will tell you more about the BF-F8 when I get the article complete in about a week. Hopefully these new articles and discussions will help generate more interest in the site and users generating more content. So be patient as the changes come. 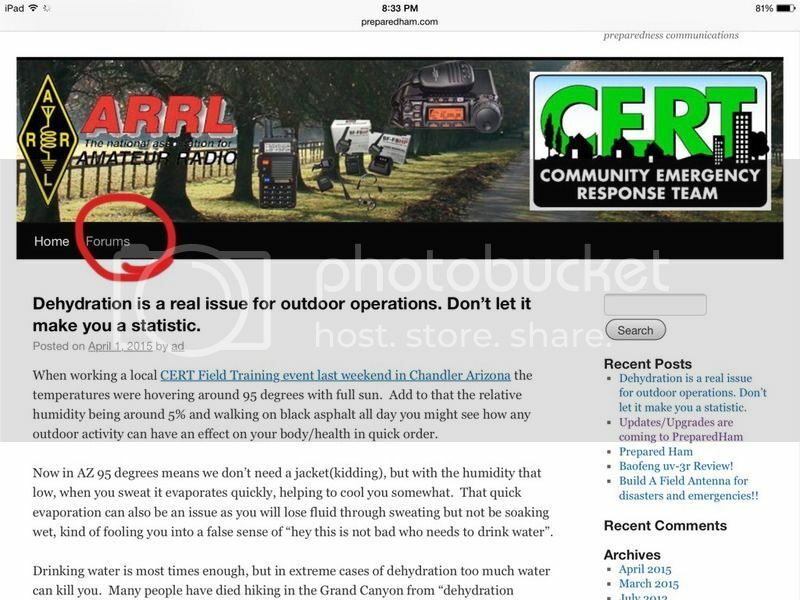 Well the first of the blog article is posted on the home page www.preparedham.com and covers dehydration while in the field. This weekends CERT field Training event was the genesis for this article. Stop by once in a while and check it out. This article does have affiliate links in it but you are not obligated to click. I love the new format! The only criticism I have is that the link to the forums is pretty far down the page. Not a big deal for us regulars, but a first timer may not scroll that far and never even know there is a forum. Have to agree. A link to the forum might be better on the same line with the "home" link. Thanks guys. Just learning(beating it to death) WordPress and its been a struggle. I need to work the bugs out and improve. If anyone has something they want to write about there is a "profit sharing plan". Email or PM me to discuss. Oh and another thing...none of the WordPress widgets appear at the top of my page. I use WordPress for my own blog and it has a feature where I can "follow" other blogs I like. When that blog posts a new article, it will appear in my reader...similar to a Facebook timeline. Maybe the theme you are using doesn't support that feature...or you didn't turn it on...or something. It does not effect the content of your website but it does encourage site traffic and provide a handy way for readers to see your new articles. Otherwise, they have to remember to visit your page on their own. My WP experience is only 2 days deep. I will be buying a more versitle theme from the same group that graywolfsurvival uses. He is a close friend of mine and has paved the way down this path already. He likes it because its responsive and work great on mobile devices. He also warned about some third party themes having malicious code that can hinder SEO functions. Any suggestions you have are more than welcome. WordPress has hundreds, maybe thousands, of free themes. It's almost suffocating trying to make a choice. I suggest not buying one unless you really, really like it that much or it has features you can't get any other way. Your friend is correct about third party themes. With so many free ones direct from WordPress, why bother? Good luck...as always you have my support.